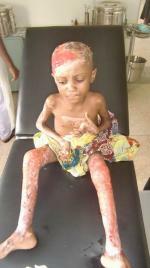 Glonazo lives in Congo, and suffered bad burns when a petrol can exploded. 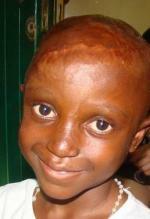 She first went to a hospital in Congo, then Kagando where we met them and brought them to Kampala for skin grafts. Her mother is incredibly grateful for the assistance we have given her. She lost her other daughter in the fire, so she is very grateful that Glonazo is healing so well. Andrew Hodges writes: I am writing this from Kagando where I have just reviewed and performed another operation on Glonazo and I wanted to send you a photo of how she is now. She has healed very well. She still needs more surgery to her hands but is very healthy and happy. When she returned to the hospital in Congo, the staff could not believe it was the same child. Definitely a good use of Interface money.